These days, Martin Scorsese and Leonardo DiCaprio are a package deal. It’s no wonder they were both chosen as recipients of the Cinema Vanguard Award. The Wolf of Wall Street is one of the most polarizing films of the year. As the latest collaboration from Martin Scorsese and Leonardo DiCaprio, it tackles the corrupt world of Wall Street traders. Set in the late-’80s and early ’90s, The Wolf of Wall Street is proving to be one of Scorsese and DiCaprio’s best. After over 10 years of working together, the director and actor are being honored by the Santa Barbara International Film Festival. The duo will receive this year’s Cinema Vanguard Award. According to The Hollywood Reporter, Scorsese and DiCaprio will be presented with their statues Feb. 6 at Santa Barbara’s Arlington Theatre. Previous recipients of the Cinema Vanguard Award include Amy Adams, Nicole Kidman, Vera Farmiga, Peter Sarsgaard, Stanley Tucci, Christoph Waltz, Kristin Scott Thomas and Ryan Gosling. That’s not bad company to be in. 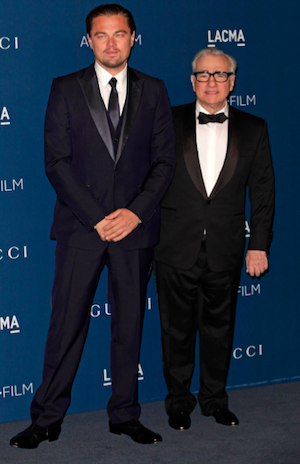 Scorsese and DiCaprio’s list of films include Gangs of New York, The Aviator, The Departed and Shutter Island. The latest, The Wolf of Wall Street, opened on Christmas Day and has been nominated for multiple Golden Globe and film critics awards. The Santa Barbara International Film Festival runs Jan. 30 to Feb. 9.